The third edition of the Egyptian Society of Hypertension: Egyptian Hypertension Guidelines was released in early 2014. In this article, Professor Omar Awwad explains why these locally specific guidelines were necessary, and what benefits they bring to patient management. Do we still need guidelines for the management of hypertension? Is there a need for national guidelines? The answer to both questions was ‘yes’. Without treatment guidelines there is a higher likelihood of an irrational use of available resources. It is therefore important that any choices or decisions regarding hypertension management should be made with the local budget (and other circumstances) in mind. Guidelines from developed countries may be difficult to apply successfully in developing communities because of existing poverty, high illiteracy rates and an inadequate healthcare system, as well as racial, genetic, lifestyle and environmental differences. There are many differences between the guidelines for hypertension management produced in different regions and countries around the world. This article outlines the key differences between the Egyptian guidelines and those from other countries. Home measurement of blood pressure (BP): The Egyptian guidelines encourage home BP monitoring because it is of low cost and highly available. Home BP monitoring is also reproducible, can lead to improvements in hypertension control and can diagnose white coat or masked hypertension. Higher diagnostic BP level for hypertension: The most important difference between the Egyptian and other hypertension guidelines is the level at which hypertension is diagnosed in low-risk patients: 150/95 mmHg instead of the 140/90 mmHg set by other guidelines. This higher level better correlates with ambulatory BP monitoring for the diagnosis of hypertension and also with clinical outcome. The definition and classification of hypertension according to the Egyptian guidelines is outlined in Table 1. The risk of hypertension over-diagnosis in clinical practice is also lowered by the higher threshold because of the reduced likelihood of a white-coat effect. In addition, the higher diagnostic BP level also establishes a more practical and cost-effective strategy in a society with limited healthcare resources. Risk categories for hypertension in Egyptian patients are presented in Table 2. Better use of routine laboratory evaluations: The Egyptian guidelines divide the routine laboratory investigations advocated in other guidelines into ‘essential’ (should be undertaken in all patients with hypertension) and ‘recommended’ (undertaken according to the clinical situation of each patient, to keep costs down). ‘Essential’ laboratory investigations include urinalysis to check for protein, blood and glucose, together with routine fasting blood glucose testing, and creatinine measurement. Other investigations (e.g., lipid profiles, uric acid levels, electrocardiography and optic fundus examination) are ‘recommended’ rather than ‘essential’. Emphasise lifestyle modification: Great importance is put on lifestyle modification before starting pharmacological therapy in patients with mild or moderate hypertension. Nine specialised hypertensive clinics have been organised across Egypt. Each clinic is equipped with well-trained nurses to help encourage patients to adopt lifestyle modification measures such as: weight reduction (if overweight); regular physical exercise, e.g., a brisk walk (30–60 min/day) ≥5 days/week; reducing salt intake to <5 g of sodium chloride/day; encouraging a healthy diet; stopping smoking; minimising stress. Initial selection of drug therapy: In agreement with the American guidelines, the Egyptian guidelines recommend diuretics as first-line therapy for hypertension. This is because of their relatively low cost and because they usually potentiate the effectiveness of other antihypertensive agents (as most patients require more than one drug to treat hypertension). 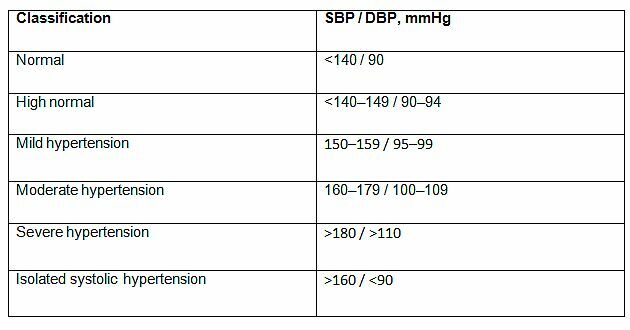 Target BP: As mentioned above, the Egyptian guidelines allow for a higher BP level than other guidelines (150/95 mmHg) before initiating therapy in low-risk patients. This higher target BP (150/95 mmHg) is also the goal for elderly people (>65 years of age) with mild-to-moderate hypertension. Antihypertensive treatment(s) should be started in all patients with a BP above this level. What to do about BP variability: There are two types of BP variability: physiological and pathological. Physiological variation refers to the circadian pattern of BP over 24 h, which may be of prognostic value in patients described as ‘non-dippers’ (i.e., in whom BP drops by <10–15% during sleep). Pathological variation refers to when BP shows large spontaneous variations from time to time during the day and between days, months and seasons, and is shown to be related to cerebrovascular affection. BP variability can be diagnosed by ambulatory BP monitoring. 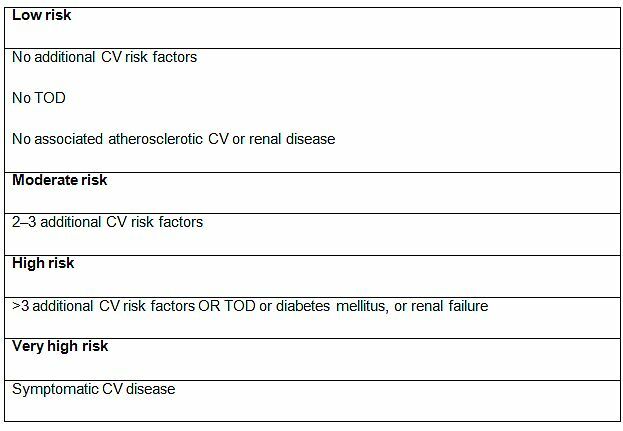 Symptomatic established CV or renal disease in very high-risk patients (e.g., coronary artery disease, CV disease, peripheral arterial disease, heart failure and abdominal aortic aneurysm). How to improve patient adherence: Measures to improve patient adherence include: apply a simple regimen; use a combined antihypertensive pill; prescribe affordable drugs (generics); ask patients about side-effects; encourage home BP readings. The Egyptian guidelines aim to adapt science to circumstances. Resources, more so than science, should dictate the type of care that can be provided. Guidelines have to compromise between what is ideal and what is actually possible.